This book documents the old Johnston mill site (1793), which was sold to William Robson in 1810, for $3500. Then George Johnston and his son, built a second mill, a saw mill, on New Hope Creek. This would lead to a law suit with Robson in 1823. Original documents, including many depositions and a letter to Judge Ruffin, tells the whole story. 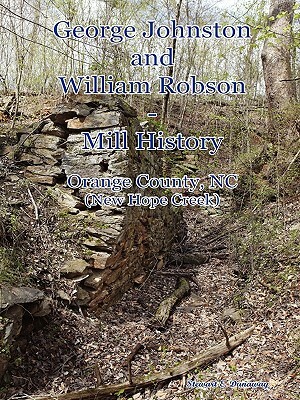 This book covers both of these mill sites and even a third mill site - Charles Johnston on New Hope Creek near Turkey Farm Road. This book has all the deed records, plats, pictures, maps and many drawings, describing the mill operations, and locations. Some basic genealogy is provided on the Johnston, and more so on for the Robson family. Cemetery locations, images of tombstones, and even the slaves burial sites are shown.